1. New authors need as many eyeballs as possible reading my their eBooks. 2. According to Amazon rankings there's no difference between a bought eBook or a free eBook. Either way the more people download it for free, the higher your book will be ranked. 3. New readers will recommend you to their friends and family. 4. More people reading your book, the more chance of a review. 5. A great way to promote your book, and inexpensive way to attract attention to your work. 7. Think about what your future sales could be, just by giving an eBook away for free. I'm still an unknown author on such a huge platform, it's in my best interest to get as many people as possible downloading or buying a copy of any of my books. People love free stuff, don't hide away your writing, you need as many people as possible reading your work. As crazy as it sounds, it's a great selling strategy. Over the coming years I have no idea how it will pan out, but I do know that people love free stuff, and finding a book worth reading for free is a must-have item. 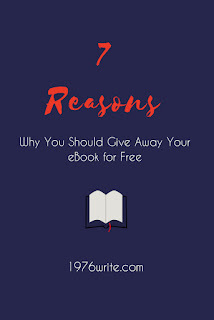 Allowing people access to your eBooks for free can only help you as new author. In these tough times you have to think outside the box to survive.